12ch MIDI to trig converter Ladik M-210 for eurorack / Doepfer A100 system. Works as “12ch” or “11ch+1accent” MIDI to trig interface (accent active if note velocity is 80 or more). 1.press learn button, LED lights up. 2. play 12 notes (any notes on any channels) and you are done, LED goes off. Setting and mode is memorized even when switched off. To switch between 12ch/11ch+acc modes – press and hold learn button at powering. Every output can be assigned to any channel/note independently. All outputs works at the same time. 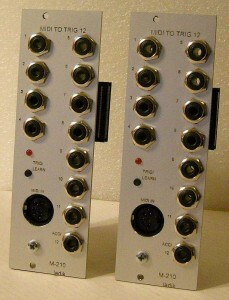 Shipped with 12ch mode set, MIDI CH1, notes “middle C” to “H” (midi notes 60-71). LED blinks shortly at receiving any correct (set) note. Not need for 5V rack power bus (powered from 12V rail only).